On Monday this week, SA Breaking News reported that 10 members of a suspected rhino poaching syndicate had been remanded in police custody until their formal bail application to be heard next Monday (29 September). Add your signature to a petition aimed at denying them bail (see link below). Police spokesman Paul Ramaloko said that the suspects allegedly illegally obtained 84 rhino horns and killed 22 rhinos valued at nearly US$2 million. ‘The intelligence-led arrest comes after a year-long investigation by key stakeholders in government and the private sector,’ he commented, adding that one of the accused, Hugo Ras, is thought to have been running the syndicate for some five years. To find out more about this man and his activities read Julian Rademeyer’s comments here. They paint a chilling picture of the man. (Rademeyer is the author of the best-selling exposé Killing for Profit). ‘The team arrested the other members of this criminal group simultaneously in Polokwane in Limpopo, Ficksburg in the Free State, Potchefstroom in the North West, and in Montana, Mamelodi and Kameeldrift in Gauteng,’ Ramaloko continued. 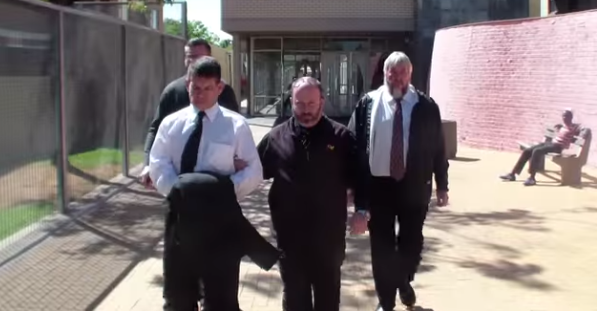 The suspects, Ras, his wife, Trudie Ras, and his brothers, Anton Ras and Arno Smith, Bonnie Steyn, a pilot from Ficksburg, Willie Oosthuizen, a warrant officer of the Hawks in Pretoria, Joseph Wilkinson, an attorney from Pretoria, Christoffel Scheepers, Mandla Magagula and Willem van Jaarsveld briefly appeared in the Hatfield Magistrate’s Court on several rhino-poaching charges. Lieutenant General Anwa Dramat , the National Head of the Hawks, said they will continue to address these types of syndicates: ‘They have no sympathy towards our already endangered species – rhinos. It is clear that they have no regard for the rule of law. Allison Thomson from Outraged South African Citizens Against Rhino Poaching (Oscap) said they were grateful to finally see the syndicate behind bars. ‘We salute all those organisations that were involved in these arrests for their tireless behind the scenes work and applaud them’, she commented. 318 charges related to their involvement in rhino poaching and other associated crimes. Furthermore, ‘the accused all have the means and ability to flee the country’ reads the petition posted on AVAAZ.org, on Tuesday. The petition and already has over 5,000 signatures from people all over the world. Add yours here. I have often wondered why Africans are so willing to let the beauty and abundant resources their continent has been so richly blessed with be destroyed for the highest bidder. Resources so precious they can never be replaced once gone. Resources that could make the country rich, productive and abundant if cared for. they should never see the light of day again. Hard labour for them, and when they can no longer work and add some value, then harvest their organs for people in dire straights and pull the plug! Lock them up and throw away the key !!! Hope they stay in prison for a long long time. Make examples of them…. this has to stop. Poaching is a multi-billion dollar industry that’s pushing many species to the brink of extinction. According to the World Wildlife Fund, there was a 3,000% increase in rhino poaching between 2007 and 2011. An estimated 12,000 African elephants are killed each year for their ivory. Poachers’ methods are incredibly brutal, with stories of rhinos bleeding to death, baby gorillas getting caught in traps, and elephants brought down by power lines. Without immediate action, more and more animals each year are going to suffer and die needlessly. they should get the same treatment as they did to the rhinos DEATH! KEEP THESE MEN BEHIND BARS AND GIVE THEM ALL LIFE SENTENCES. Sorry, I thought I was leaving a comment regarding rhino killers. Ivory belongs on the animal that nature decided upon, This HORRIFIC killing of innocent animals HAS TO STOP!!!! Sometimes the animal is STILL ALIV E after this is done. CRUEL,EVIL TORTURE No animal desrves this….Made worse because these are supposed to be professional,intelligent,empathetic people…Theyre nothing more than sadistic serial killers & when the animals are extinct what will they turn to?????????!!!!!!!! Give them 60 years, every single year of it ! Keep these killers behind bars. Those rhinos suffered terribly, and died for greed. Punish them to full extent of law, and keep them in jail. Give them 20 years minimum. It about time justice is done !!! Throw away the key !!!! They Need to Stay in Jaill” …..these heartless people” are ruinning these Beautifull beings lives” .!!!!!!!!!!!!!!!!!!!!!!!!!!!!!!!!! !Let them Stay: behind Bars” .!!!!!!!!!!!!!! No bail for any of the ten.Prison for many a year. It’s a pity that we keep losing our wild treasure, its time no mercies should be granted to any criminal. These greedy, vile creatures have no heàrt, no soul, they should have no rights ! Anyone who slaughters defenseless animals for sport , entertaiñment or money need to be locked away for a very long time so the good of animals n community can be at peace !